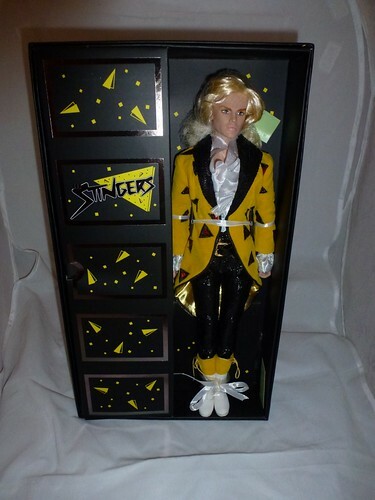 Rory “Riot” Llewelyn was the lead singer of The Stingers, formidable rivals to the Holograms and Starlight Music. Riot used his musical abilities and bad-boy charisma to gain a massive following; only Jerrica Benton seemed immune to his charms. His relentless pursuit of power (and romantic interest in Jem) led to many wild adventures for the Stingers and the Holograms alike. 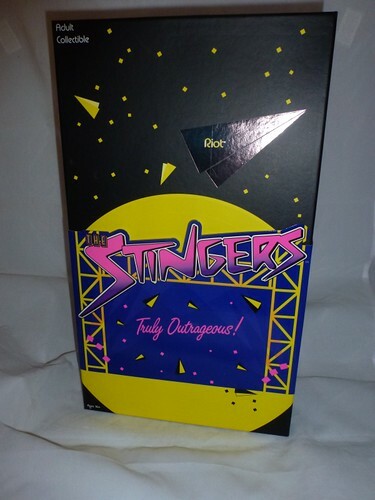 The Stingers’ boxes are in their signature colors, black and yellow. The cardboard band quotes the lyrics of the Stingers Theme and gives a quick explanation of who these mysterious figures are. Once you remove the lid of the box, you are confronted by Riot and his “dressing room”, where all of his accessories are stored. Riot is tied to his packaging with white satin ribbons, and his fluffy bleached-blond mane is in a protective hair net. I’d like to take a moment to admire how faithfully Integrity Toys recreated Riot’s truly amazing outfit. He has a golden yellow frock coat, lined in shimmery gold and embroidered with black-and-red triangles. You can’t quite tell in this photo, but his coat collar is covered in tiny black sequin-type discs. He has a white frilly blouse that’s open almost to his navel. His shiny textured black pants are beyond belief. 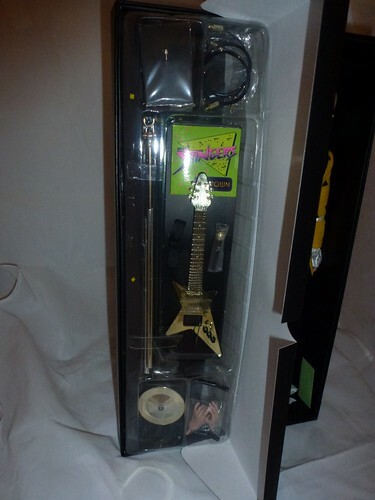 Riot’s accessories include a single earring, a gold electric guitar (distinct from Pizzazz’s holographic gold electric guitar), a gold-toned microphone, a microphone stand, extra hands, and a stand. 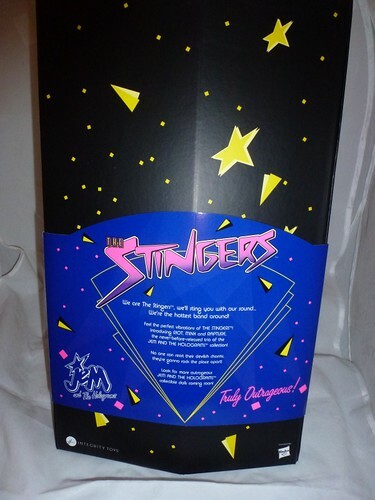 The stand base says “Jem and the Holograms” rather than “The Stingers”, presumably because that’s the name of the toy line. 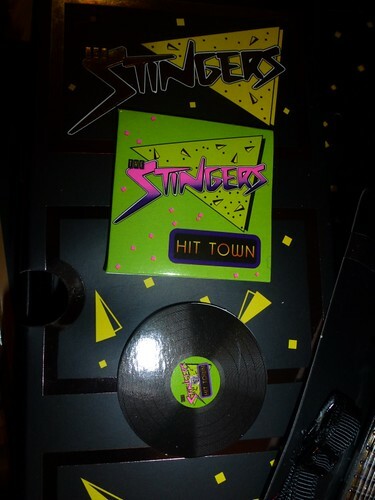 The paper accessories are a “The Stingers Hit Town” album sleeve and record. They’re not as detailed as some of the other extras we’ve had in the past, but given the massive amount of attention paid to Riot’s outfits and plastic accessories, it’s hard to complain. 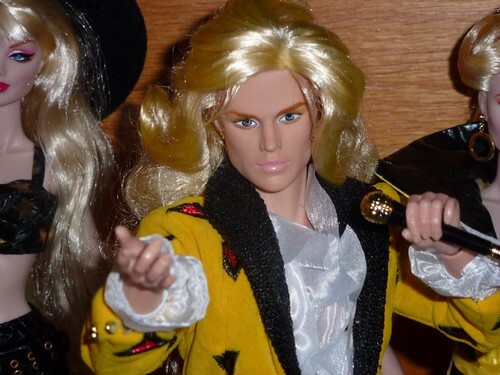 Overall, this fashion doll does a remarkable job of capturing Rory “Riot” Llewelyn’s intensity and hypnotic charm. It may have taken 25 years, but Riot has finally arrived.